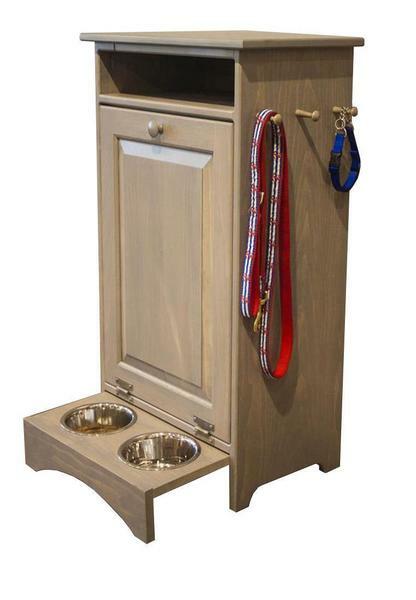 This solid pine wood pet feeder station is the perfect all-in-one product for your beloved companion. Whether cat or dog, their toys, accessories, and treats can be stored on the top shelf, plus additional side dowels come standard for convenient access to your leashes or other hanging accessories. Dowels can be placed on either side (left or right) of the cabinet. When it comes to meal times, an easily accessible 28 quart plastic food storage container can be found inside the unique tilt out door. The plastic food container comes with a sealed lid and a secure latch to hold in the freshness of the food. When your pet is ready to eat, pull out the hidden food & water bowls from the bottom of the cabinet and fill the bowl with food from the tilt out container above. When meal time is over, simply close up the food bowls to keep them out of site and concealed inside this attractive piece of handcrafted Amish Furniture. It doesn't get more convenient than that! Everything you need for your companion is all in one place to prevent lost items and a clutter house. Plus, it is all handcrafted by one of our talented Amish woodworkers to ensure top quality craftsmanship. Also, for easy maneuverability to anywhere in your home, optional smooth gliding caster wheels are available for underneath your cabinet. Design a custom look for your pet feeder by selecting one of our premium finishes for a color that will match your existing furniture and blend in to look like any other end table or cabinet when closed up and not in use.